“Arriving at the watering hole, I caught the briefest glimpse of a lioness lounging behind the nearby berm. I had finally found a lone lioness! 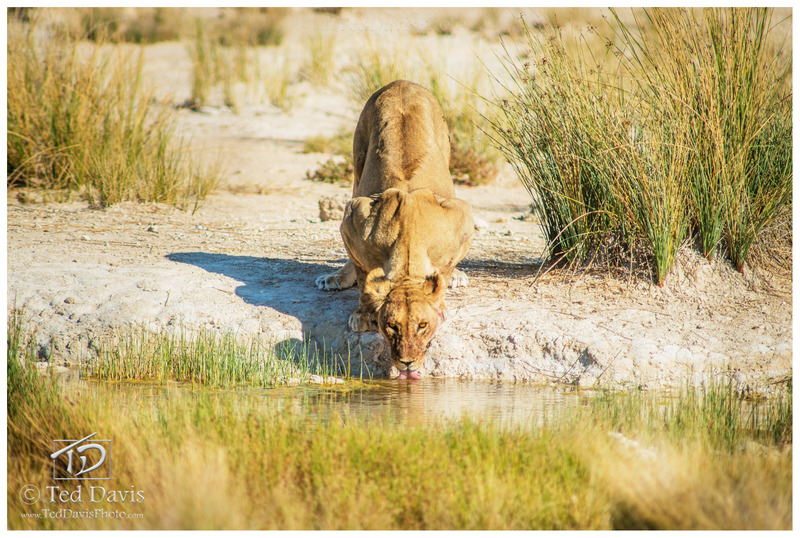 Setting up both tripods and cameras, I settled in to wait until the heat drove the lioness to the watering hole for water. Nearly an hour later over this rise to the west walks a parade of 6 Zebra and a Wildebeest. I couldn’t believe it, but this little herd was aiming straight for the lioness! As the herd passed by the berm, I saw two dark shapes, (2!) just above the level of the grass, dart behind the Zebras. The two shapes quickly coalesced into female lions rushing the grazers. One went for a trailing Zebra and the other for the Wildebeest. This, I think, was their mistake. A lucky break as the lionesses hesitated, perhaps confused, and the herd was scampering across the open plain to safety. Padding out onto the plain for a few meters, the lionesses leisurely returned to the watering hole for some refreshment. Snapping shot after shot I noticed both lionesses had rather large stomachs indicating that they had fed recently. So perhaps this quick hunt was more out of a desire to take a meal when it walks right up to you, but not a life or death necessity – at least for the lions!”. Photo © copyright by Ted Davis.